You GUYS, guess what……..Cherry Season is here!!! One of my favorite memories as a child is from the summertime, sitting around the table with a bowl full of cherries and my sisters and I having contests of who could clean the pit the best. Of course one of us ended up cheating by saying we had to “go to the bathroom” and running the pit under water. Not suspicious or anything, ha! The beauty of cherries is that they are one of the few things left that I feel are truly seasonal. They hit the grocery stores hard and heavy when they are around and then *zip*! *flash*! they are gone. And we are left longing for them until the next year. Well, fear not my lovely readers! This recipe I am about to toss at you will keep the cherries around for a few weeks. How?, you might ask. Well, magical things happen when you mix bourbon with some sugar and other yummies. 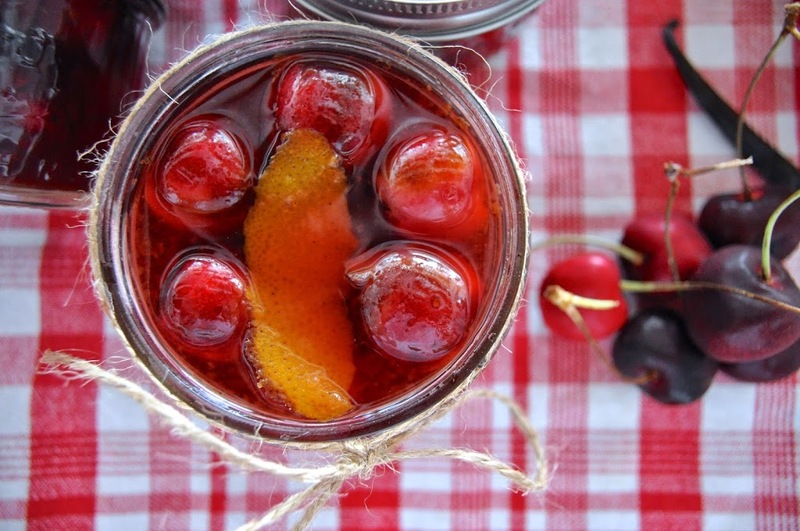 Toss in some cherries and you have a month’s long worth of tasty delights to eat straight from the jar, over some vanilla gelato or thrown into a cocktail. Oh, yeah, you’re drooling aren’t you? Happy cherry season to you! 1. Wash the glass jars and lids in the dishwasher to sterilize. Divide the cherries between them and set aside. 2. Pour the bourbon and grand marnier into a small saucepan. Add the cane sugar, orange juice, orange zest and then scrape the inside of the vanilla bean into the pan and add the bean itself as well. Bring to a simmer and stir until the sugar is completely dissolved, about 5-6 minutes. 3. 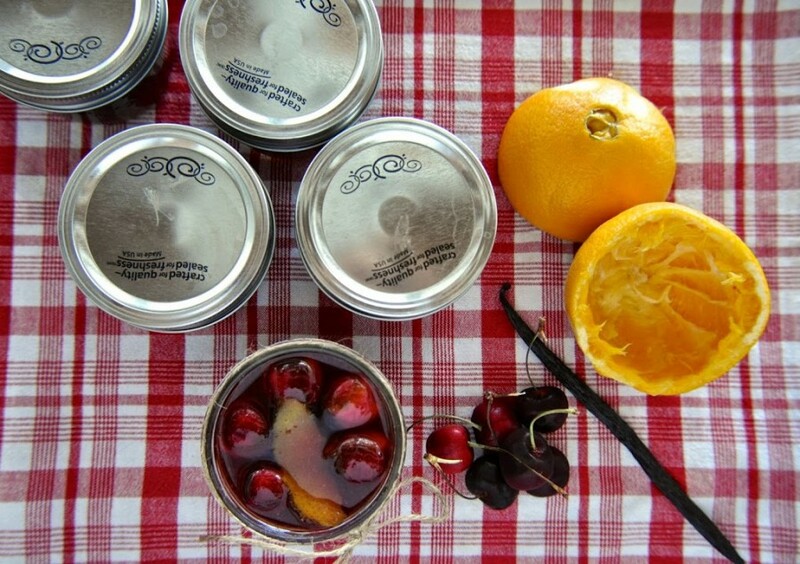 Pour the liquid over the cherries in the jars and seal with lids. Cool on the counter and then pop in the fridge. Wait at least 4-5 days before eating. Will last in the fridge for about 4-5 weeks.